NBA 2K Playgrounds 2 is bringing arcade-style basketball to consoles on October 16, 2018 for $29.99. There’s even a trailer showing off a few new courts, extra game modes, and signature moves from some of the greats. Who’s ready to “ball without limits” with some footage? As soon as word came out that 2K would publish this sequel, hope was reignited in this franchise. Not only is Saber Interactive bringing their knowledge from the first development cycle, the company has teamed up with the folks responsible for what’s widely considered the best realistic basketball simulator on the market, NBA 2K. NBA 2K Playgrounds 2 already looking promising, with a lot more content packed in at the launch of the game and plenty planned to come via post-launch updates. It’s already confirmed that there’ll be dedicated servers for the game, hopefully side-stepping online issues that stifled the first entry. Single-player and co-op game modes featuring both local and online play. Playgrounds Championship mode: a worldwide ranked league with multiple competitive solo and co-op ladders. Season mode: a new single-player campaign in which you lead a team through the regular season and playoffs. Additional modes such as four-player online games, co-op matches against AI, three-point contests, off-the-wall power-ups, custom matches, and more. Over 300 players at launch: including legendary new additions like Michael Jordan, Kobe Bryant, and Kareem Abdul-Jabbar. Nearly 200 additional players arriving via post-launch updates. Ten new courts: including Washington, D.C., St. Louis, Seoul and Australia. Additional courts are planned, post launch. Over 100 signature moves, such as Michael Jordan’s free throw line dunk, George Gervin’s Iceman finger roll and LeBron James’ self alley-oop. New customizable items: such as jackets, shirts, pants, shorts and shoes. Soundtrack featuring licensed songs from artists such as Run The Jewels, Odisee, and DJ Premier. For those who are unfamiliar with the series, but wary of 2K’s use of microtransactions, it’s worth noting that while player packs exist in NBA Playgrounds (and are random), they were only unlockable by playing the game. While 2K has made no mention of how player packs will function in NBA 2K Playgrounds 2, keep in mind that the first game had zero microtransactions. 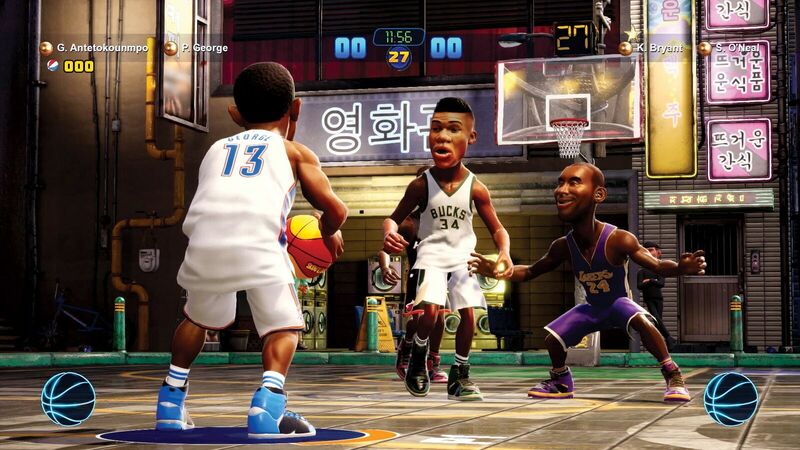 We enjoyed the first NBA Playgrounds, but definitely had some complaints. The main issue with the first NBA Playgrounds was the lack of launch content, some performance issues, and a few notable design flaws. But all of this was (mostly) fixed via post-launch patches. Still, like a lot of the community, we saw potential in this IP, and maybe NBA 2K Playgrounds 2 will do better? You can step to the court yourself on October 16, 2018, when NBA 2K Playgrounds 2 comes to the PlayStation 4, Xbox One, Nintendo Switch, and PC.